Did you know that 92% of retail marketers plan to increase their use of location intelligence and that 81% believe it’s been vital in improving their marketing performance? We commissioned a report with 451 Research to understand how location intelligence has impacted the retail industry. Download our latest white paper for strategic insights into how marketers leverage location intelligence for consumer journey mapping, competitive insights, market trends and much more. As the retail world continues to push toward an omnichannel future, substantial change is being driven by online-only retailers and direct-to-consumer (DTC) brands. While this shift is substantial for traditional retailers, consumers still value a physical retail presence. 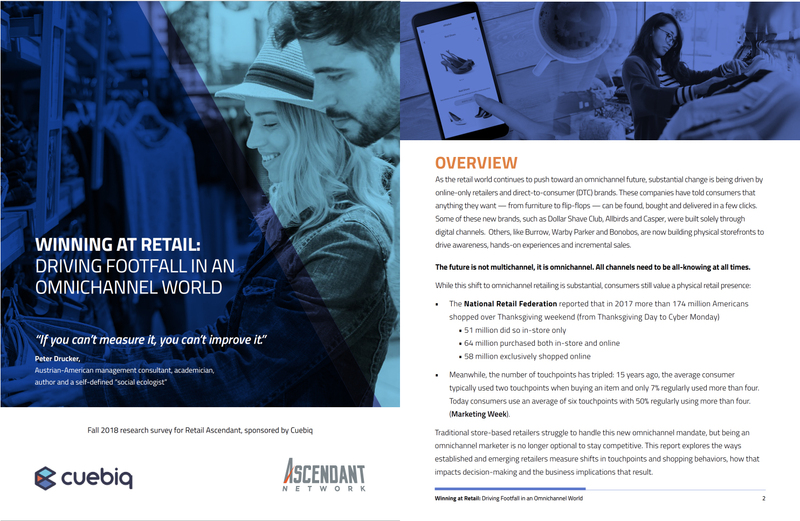 In order to help retailers, we’ve commissioned this study with the Ascendant Network to provide them strategical research and recommendations. How to plan against new sources of competition. How to effectively measure foot traffic to physical stores. How to leverage online to offline insights for strategic planning and more. Interested in knowing more or would like a guided walk-through of this study by a Cuebiq representative? Contact our team of experts.